Samuel Achilefu is an Associate Professor of Radiology, Division of Radiological Sciences at the Washington University School of Medicine. His work involves the design, synthesis and performance of in vitro and in vivo evaluation of molecular beacons for use in optical, scintigraphic, ultrasonic and magnetic resonance imaging of cancer. Dr. Achilefu serves as a Member of the Scientific Advisory Board of Piper Resources Ltd. and ART Advanced Research Technologies Inc. 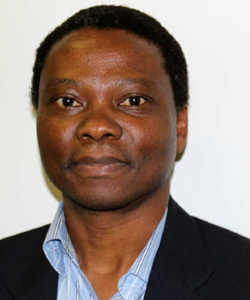 He serves as Trustee at Loma Linda University Medical Center, Inc. Dr. Achilefu holds a Ph.D. in Chemistry from the University of Nancy, France and was a Postdoctoral Research Fellow, Bioorganic/Inorganic Chemistry at Oxford University, from 1991 to 1993.